Abstract: AMD's Athon XP2100+ is a 1.73GHz processor set to the tune of a 0.18 micron Palomino core and a spritely green OPGA package. The number 21 has always been lucky. Just like a full hand in Black Jack, that first stick of PC2100 DDR, and now the first XP 2100+, we have something very cool in our hands. AMD's Athon XP2100+ is a 1.73GHz processor set to the tune of a 0.18 micron Palomino core and a spritely green OPGA package. The XP lineup features QuantiSpeed Architecture, 384KB of cache, and continuing support of AMD's 3DNow! technology. 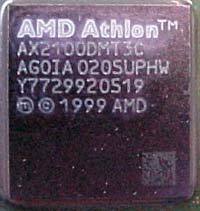 Like other Athlon XP processors, the XP2100+ works with a 266MHz Front Side Bus (FSB) and comes from the AMD fab in Dresden Germany, where they make good sausages. The newest processor in AMD's successful Athlon XP lineup is being launched officially at CeBit 2002 today along with the Athlon MP 2000+ for servers and Athlon 4 1600+ for notebooks. The Athlon XP 2100+ processor is priced at around $420USD (in OEM quantities), which is less expensive then comparable Intel Pentium 4 offerings. Other than the increase in speed over the XP2000+ (1.67GHz) the XP2100+ is essentially the same, with a 1.75Vcore setting. Unlike other AthlonXP processors we have reviewed, the AthlonXP 2100+ uses AMD's new green FC-OPGA packaging. 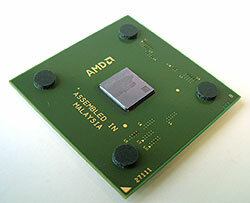 Previous processors used a rather drab brown colour which has since been discontinued. This was done because of consumer's reaction to the brown colour, and to reinforce the AMD logo. Personally, as long as the chip runs fast and stable I am happy! The only changes the AthlonXP 2100+ brings to the table is a higher clock speed. One of these days it would be nice to see AMD adopt the heatspreader it showed off on its 64-bit Hammer processor line to protect the die. After all, we have seen countless broken, chipped and damaged Athlon cores. A heatspreader would protect the brittle silicon as Intel has done for their Pentium 4. The four pads are nice, but they really don't offer much in the way of core protection. On the bright side of the thermal world, AMD has implemented a internal thermal diode into the AthlonXP CPU... however there are still a scant few motherboards that support it fully (Fujitsu-Semiens is the only manufacture that comes to mind). The AthlonXP 2100+ follows in the footsteps of earlier models and supports hardware prefetch capabilities. What this does is it will look at the processes that are happening and try to predict what data will be required next and cache that data into memory. This methodology for example can help boost office based applications which are easily predictable. Realistically speaking, the AthlonXP 2100+ brings no additional technologies into the core, so if you would like to read a bit more about it, please see our AthlonXP 2000+ review. The core frequency of the AthlonXP 2100+ is 1733 MHz and it uses a 13x multiplier while running along on a 133 MHz DDR FSB (or 266MHz SDR FSB). The L1 bridges, sadly, remain laser cut making multiplier unlocking more difficult but still possible. AMD has publically said that they don't mind enthusiasts overclocking their processors, however they obviously want to deter the newbies from getting into trouble. The Palomino core just keeps on surprising me. I was pretty sure that the Palomino core was near its limit when we first looked at the AthlonXP 1800+ (AGKGA) which was able to overclock all the way up to 1.7GHz. Then along came the AthlonXP 1900+ (AGNGA) which managed a nice little 1.8GHz overclock. With a decent copper heatsink and simple air cooling (Vcore to 1.85V), we were able to push the AthlonXP 2100+ as high as 1.89GHz (AGOIA)! Amazing, how much further can this core go? With the 0.13 micron Thoroughbred just around the corner on, you really have to wonder how much further the 0.18 micron Palomino can stretch. Overclocking was accomplished by FSB adjustments only, look for an updated list of results once the conductive paint dries.